Bombardier Recreational Products, or simply BRP, has a long legacy of innovation with multiple brands of off-road vehicles and watercraft, including Can-Am all-terrain vehicles and Rotax, which builds the engines for almost all BRP products. BRP entered the all-terrain vehicle segment in 1998. Within a year that first model, the Traxster, was named “ATV of the Year” by ATV magazine. In 2002, BRP again shook up the market with its Traxster MAX, the first ATV approved for two people. And with the Traxster XL, BRP introduced the first 4WD ATV with a dumping bed. In 2006 BRP, relaunched its ATV products under the Can-Am brand, a name formerly used for the company’s line of motocross and dirt bikes. Then in 2010, BRP launched its first Side by Side, the Can-Am Commander 1000. It was promptly selected as a “Best of the Best” by Field & Stream magazine. Several victories in the Dakar Rally have helped seal the Can-Am brand reputation for performance and ruggedness. In 2013, the company added the Maverick line of pure sport Side by Sides to sit aside the Commander line, which provides a blend of sport and utility. As great as these machines are, there’s always room for improvement. 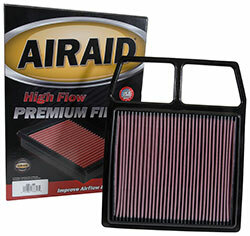 Take the AIRAID 850-601 direct fit replacement air filter for example. 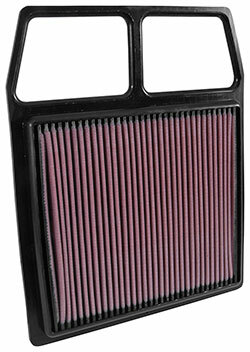 The 850-601 filter is a drop-in replacement for the stock air filter in select Can-Am Commanders and Mavericks. By doing so, you can increase the performance of your Side by Side. The AIRAID direct fit replacement air filter is designed to improve horsepower and acceleration by increasing air flow into the engine. With more air coming through the intake, the engine recognizes it can add more fuel, the result being more energetic combustion and an increase in power. The key to the performance increase provided by the AIRAID 850-601 air filter is that it’s constructed with multiple layers of cotton gauze & non-woven synthetic filter media, a combination of the two best filter materials in use today. This hybrid filter media provides significant improvements in air flow and filtration compared to typical replacement filters, but at the same time provides outstanding protection against damaging contaminants reaching your engine. And there’s no need to purchase a new paper filter each time the old one gets dirty when you can upgrade to a serviceable AIRAID direct fit replacement filter for often less than the cost of two stock replacements – as well as keep non-recyclable used paper air filters out of landfills. Installation takes only a few minutes and is as simple as replacing your stock filter element. To make things more convenient, the 850-601 is both washable and reusable. To maintain performance, check your AIRAID filter regularly and more frequently if your travel off-road or in heavy dust conditions. When the filter appears dirty, it’s time for a cleaning. The best and easiest way to service your filter is with the AIRAID 790-558 premium dry filter cleaning solution. And of course the 850-601 is backed by AIRAID’s “No Hassle” Lifetime Warranty, which is simple. If you are ever dissatisfied with the materials, workmanship, or performance of this replacement air filter, call us at 800-498-6951 and we will be happy to assist you. You don’t have to worry about filling out of holding onto a warranty card; AIRAID filters are warranted for life. 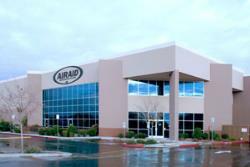 All AIRAID premium filters are proudly manufactured at AIRAID facilities here in the USA using only the finest raw materials available and highly specialized manufacturing equipment to ensure a level of quality control no other air filter company can match. This is just one of many reasons why all of AIRAID's filters are backed by our "No Hassle" Lifetime Warranty.